Current USPS flat rate padded envelop for 1-4 rakes. For more than 4, email us for cost. Actual postage and possible custom rates at the time of shipment. If you or your pet are unhappy with your RescueRake within 30 days from delivery confirmation, you may return it postage paid, for a refund of the purchase price, minus the original shipping. Please email us for a postage paid label. If your pet used the handle as a chew toy, sorry, but we will have to deduct 50% for the damage and cost of recoating the handle.. 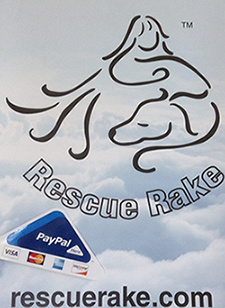 Rescue Rake, LLC (“us”, “we”, or “our”) operates the http://rescuerake.com website (the “Service”).